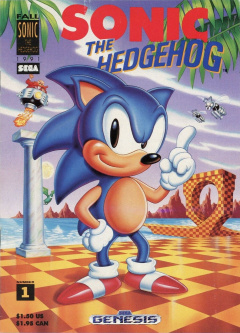 Sonic the Hedgehog is a 16-page promotional comic released in 1991, meant to advertise the original Sonic the Hedgehog for the Mega Drive. Originally released as a standalone comic, it was also included for free in various other publications, including issue one of Disney Adventures second volume, the October 1991 issue of Electronic Gaming Monthly, the May/June 1992 issue of Sega Visions, and Superman (Vol. 2) issue 61. In most of these free variations, however, only the first seven pages of the comic were published, the second half becoming a rarely seen oddity. The story, which dealt with the origin of Sonic the Hedgehog and Dr. Robotnik, was considered the "official" backstory according to Sega of America and Sega of Europe until 1998, when the original Japanese history was restored to coincide with the release of Sonic Adventure. The story begins on the planet Mobius, with the villainous Dr. Ivo Robotnik hot on the trail of Sonic the Hedgehog. With badniks in tow, Dr. Robotnik attempts to stop our hero, but is unable to catch up to Sonic. His Egg-O-Matic crashing into the ground, Robotnik curses the hedgehog, claiming he'll get him eventually. Sonic, his spirit intact, starts attacking the badnik army, in the process releasing the animals that are trapped inside. Laughing to himself as the rest of the badniks retreat, he accidentally stumbles into a spike trap, and is saved at the last minute by Johnny Lightfoot, one of the animals he just freed. Thankful to Sonic, the animals suggest they go see Dr. Ovi Kintobor, who they believe will be able to assist them in stopping the sudden appearance (and malicious intent) of Robotnik. However, Sonic informs the group that this is impossible, seeing as Kintobor and Robotnik are one and the same. Shocked, the animals ask how this is possible, leading into an extended flashback sequence. Sonic recounts his first meeting with Dr. Kintobor, how he accidentally burrowed into his laboratory just as the kindly doctor was putting the finishing touches on his latest invention, the Retro-Orbital-Chaos-Compressor. Sonic immediately asks what the machine is, and discovers that it is intended to absorb all the evil energy on the planet within the six Chaos Emeralds that power it. While Kintobor absent-mindedly goes into exposition mode, he stops himself once he realizes he is speaking to a prickly, brown hedgehog. The unlikely pair become fast friends, and Kintobor allows Sonic to train on his supersonic treadmill. The doctor is impressed at the speeds Sonic is able to achieve, but is unable to stop Sonic as he runs the treadmill into overdrive, causing it to explode. Though no one is hurt, the resulting explosion changes Sonic from a bland brown into a more stunning blue, which Kintobor calls the "cobalt effect." Now fully understanding the speeds Sonic can muster, Ovi creates a pair of frictionless shoes for Sonic to prevent his shoes from burning up again. Later on, Kintobor asks Sonic to get him a soda and a hardboiled egg to munch on as he continues to work on the R.O.C.C., looking for a way to stabilize the machine until he can find a seventh, Grey Chaos Emerald. Due to the doctor's clumsiness, he spills the soda on the control panel, causing the machine to malfunction. It rips apart, the containment rings used to keep the Emeralds in place scattering, and the evil energy that had been collected so far surges through the doctor. In an instant, he transforms into the evil Dr. Ivo Robotnik, who also takes on the shape of the hardboiled egg he was holding. Finishing his story, the animals Sonic freed state it must be hopeless, but Sonic refutes them, and runs off to face the doctor again. The second half of the comic follows the paces of the game, trying to adapt as much as possible. Dr. Robotnik ambushes Sonic within the Green Hill Zone, forcing the blue blur to find a means of escape, spinning through a loop-de-loop to jump into a giant ring and enter the Warp of Confusion. The hiding place of the Chaos Emeralds, it doesn't take long for Sonic to find one, which warps him into the Labyrinth Zone. Holding onto the Emerald, Sonic is able to swim his way out, pulling himself to the shore where he meets a pair of his friends. He doesn't have long to recover before Robotnik appears, taunting Sonic with the intention of getting the emerald from him. The blue hedgehog makes chase, entering the Star Light Zone. Avoiding Orbinauts, Sonic bounces up to Robotnik's Secret Base. Even after going through all of Robotnik's traps, Sonic is unprepared to see Porker Lewis strapped to a conveyor belt, heading straight into a buzzsaw. Robotnik uses this moment to tackle Sonic, making the hedgehog lose his grip on the Chaos Emerald. Knowing he only has time to either save Porker or reclaim the emerald, Sonic chooses to save his friend, letting Robotnik get away. Freeing the rest of the animals in the base, Sonic declares that he will "Eggstinguish" Robotnik once and for all, the comic telling its readers to continue the adventure by purchasing a Sega Genesis and a copy of Sonic the Hedgehog. The following scans are from an early draft of the promotional comic, unearthed by former Sega employee Dean Sitton. These sketches, which only cover the first half of the comic above, features a vastly different art style, far more cartoony than what would be in the final product. The script is also simplified, with events such as Kintobor's transformation happening without any buildup. The artistic style was changed between this draft and the final by the request of Sega, who demanded the visuals be closer to their own promotion for the game. Such visual cues as Sonic using his fists to fight were deemed unsuitable for Sonic, instead telling the artist to focus on Sonic's natural abilities as per the game. Even the personality of Sonic was tweaked slightly, Sega telling the writer not to make Sonic a typical comic book superhero, and even preventing the original lines which had Sonic realized why he had turned blue on his own, instead of needing help from Kintobor to understand. Sonic Origin Story Documents - The original westernized proposal of Sonic the Hedgehog, on which the promotional comic is based. Sonic the Hedgehog Story Comic - Sega of Japan's answer to the promotional comic, sticking extremely close to the original source material. Sonic Comic Final Script - The original script to the promotional comic. Sonic Comic Comments 1 - The first set of suggestions from Sega in regards to the promotional comic. Sonic Comic Comments 2 - The second set of suggestions from Sega in regards to the promotional comic. This page was last edited on 13 April 2018, at 12:23.